When you need furnace repair in Palm Springs, Desert Air Conditioning Inc is the place where you will find experienced, skilled heating technicians who know their way around any type of furnace. We repair both commercial furnaces and residential furnaces. Gas furnaces keep your home warm in the winter and also act as an air conditioning support in hot weather. They are also an excellent economic option for heating your home or business. Talk to our staff and technicians about the benefits of a high-efficiency gas furnace. We offer quality brand names with the best warranties on the market. Whether you need gas furnace installation or gas furnace repair, our HVAC technicians have the expertise you want. We can work on any model, size, or age gas furnace you have. An Electric furnace is a great way to heat your home or business with forced air. They are easily installed and offer one of the safest options for heating. Desert Air Conditioning has the contractors and technicians ready to work on any electric furnace—commercial or residential, and any size or brand. 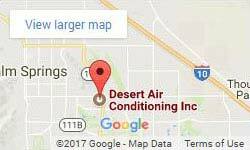 When you work with Desert Air Conditioning for your furnace installation in Palm Springs you can be assured it will be done safely, and correctly. Our certified, well-trained technicians can assess the best option for your home and then discuss the possible brands with you. We allow you to make the decision that is right for you. We are only here to offer sound advice and options. Check out our coupons and deals to see if the time and price is right for your furnace installation. It is important to keep your furnace and ductwork clean, in order to keep it working at its most efficient level. Our service plan includes a 20-point cleaning and maintenance upkeep of your furnace, ducts, vents, and thermostat. We ensure that gas furnaces are working safely without leaks or exhaust in the home or office. We also service electric furnaces to get them working their best. Having clean ducts lowers dust and particles in the air as well as keeps your heating system working proficiently. Regular furnace service and maintenance keeps your heating system working at its best, elongates the longevity of your heating system, ensures your safety, and keeps your utility bills from needlessly rising. The experts in furnace maintenance at Desert Air Conditioning can do all of that for you! Palm Springs is a city of luxury. It is a place where people come to relax and play. The many resorts Palm Springs has to offer are just the tip of the to-do iceberg. There are golf courses, biking trails, and hot air balloon rides—just to name a few. These types of activities, as well as the shopping and spas, make Palm Springs the place to go when you want to unwind!